I was on my way home last week, it was raining, the car I was travelling in was waiting for the traffic lights to change. 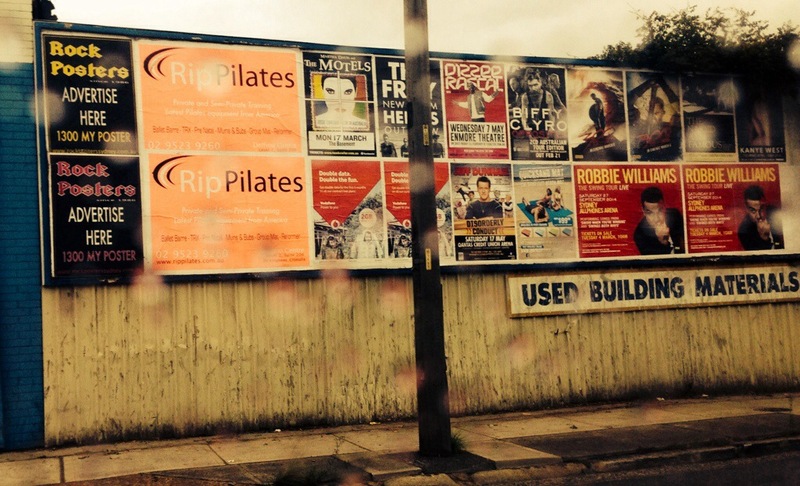 I noticed the colourful melee of posters on this billboard. I like the way the rain drops on the window distorts the colours and image. I didn’t know if I should crop the picture to the left or right side of the pole. In the end I decided life is about negotiating obstacles in our path so I left it in to remind me. It’s tough to try to figure out what I would do with another person’s shot. I find the area to the right of the pole somewhat more interesting (I like the used building materials sign) than the left, but I am not sure that would be enough to cause me to crop it into a more square-like shape. Your shot has an urban grunge feel and the pole fits right in. All in all, I like the choices you made and the resulting image. Thank you Mike I really appreciate your feedback, it is reassuring that the direction I have taken is the same as a fellow photographer would have followed.